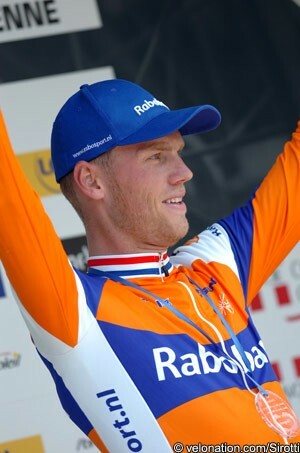 Lars Boom (Rabobank) secured overall victory in the 2012 Eneco Tour after latching on to a late attack from Alessandro Ballan (BMC Racing) on the third and final ascent of the Muur van Geraardsbergen with just over five kilometres to go. The Dutchman allowed Ballan to take the stage victory on the return to Geraardsbergen, after the duo had worked together to hold off the chasing pack; having started the day just four seconds shy of overnight leader Svein Tuft (Orica-GreenEdge) though, second place was enough for Boom to secure the race. Francisco Ventoso (Movistar) won the uphill sprint from the splintering group, ten seconds behind Ballan, to take third place, ahead of Nick Nuyens (Saxo Bank-Tinkoff Bank). Former French champion Sylvain Chavanel (Omega Pharma-Quick Step) was close to the front of the group, and moved up to take second overall, 26 seconds behind Boom. Tuft was a little further back but, having taken a bottle from his team car inside the final 20km, the Canadian was handed a time penalty and slipped out of the top ten. His third place was taken by Dutch champion Niki Terpstra (Omega Pharma-Quick Step). “The team was great. They did an excellent job today," said Boom. "First the sprinters kept control, then it was Rick Flens’ turn and in the end I had Bram Tankink and Dennis van Winden at my side. In the final it was up to me. I could break away from the others behind Ballan and Ballan waited for a bit on top. I wasn’t really bothered about the stage win after that. If I can get the GC, I find it perfectly normal that Ballan gets the stage. “The Eneco Tour is an important race for us, so of course I wanted to be good here," explained the former cyclocross World champion. "And if you can grab the final victory, you don’t let it go to waste. But on the first day I did not feel very good yet. I called it an Olympic dip myself. You just get back from the Games, spend a little while at home and then have to move on right away. I had to get back into it. The team time trial went excellent however and then I was right back. I could keep that form for the rest of the week." The 214.5km stage between Maldegem and Geraardsbergen was dominated by a nine-man breakaway from Gert Steegmans (Omega Pharma-Quick Step), Marcus Burghardt (BMC Racing), Pablo Urtasun (Euskaltel-Euskadi), Tosh Van Der Sande and Maarten Neyens (both Lotto-Belisol), Wout Mol (Vacansoleil-DCM), Pavel Brutt (Katusha), Danilo Hondo (Lampre-ISD) and Linus Gerdemann (RadioShack-Nissan). The break was never able to open a very big lead over the peloton, and was finally caught with 28km to go, as they tackled the Muur for the second time. There then followed a series of counterattacks - with the most effective coming from Jan Bakelandts (RadioShack-Nissan), who managed to get 40 seconds clear with 12km to go - but it was Ballan’s move on the Muur, which was followed by Boom, that was finally decisive. Following a succession of flat stages, with nothing more challenging than the multitude of Benelux speed bumps for the peloton to climb, the seventh and final stage of the Eneco Tour was to be a veritable Ronde van Vlaanderen. Included in the course were ascents of the Leberg, Valkenberg, Tenbosse, and Eikenmolen but, most tellingly, there were to be three climbs up the fearsome Muur - so controversially overlooked in the Classic race the previous April - with the finish coming on it’s cobbled lower slopes. After a fast start to the stage - where the peloton covered 44km in the first hour - Steegmans, Burghardt, Urtasun, Van Der Sande, Neyens, Mol, Brutt, Hondo and Gerdemann finally escaped. Slowly the nine riders began to build an advantage over the rest of the peloton and, as they arrived at the hilly circuit, they were 2’40” ahead. Brutt was the best placed overall, just 1’15” behind Tuft in 22nd position, but Gerdemann and Steegmans were not far behind him, at 1’20” and 1’34” respectively. With the gap at 2’50” in mid-stage, Jelle Wallays (Topsport Vlaanderen) counterattacked from the peloton and tried to bridge across. The young Belgian was not able to stay away for long however and, as the peloton pulled him back it began to close the gap on the nine leaders. With 100km to go, the leaders’ advantage was just 1’25”, but it was allowed to slip out to more than two minutes once more. Orica-GreenEdge was keeping the break under control, but allowing the gap to remain, and, with 50km to go, it was still 2’14”. At this point though, the Saxo Bank-Tinkoff Bank team surged forward on the climb of the Valkenberg and began to lift the pace; by the time they reached to top of the climb, the gap was down to 1’30”. Urtasun was beginning to struggle on the succession of climbs, and was beginning to yo-yo off the back of the lead group. The Danish team increased the pressure again on the Tenbosse a few kilometres later, but Daniel Oss (Liquigas-Cannondale) counterattacked over the top. Despite being right at the front all the way up the climb, Tom Boonen (Omega Pharma-Quick Step) was forced to stop and take a new rear wheel from teammate Stijn Vandenbergh at the top. The gap was just 1’03” with 40km to go but, just as Boonen rejoined the rear of the peloton, race leader Tuft also suffered a puncture. Saxo Bank-Tinkoff Bank was keeping a stiff pace at the front, giving the Canadian a tough chase, and he had not yet regained contact as the peloton hit the Eikenmolen with 38km to go. Urtasun and Brutt, who had both been dropped, were picked up shortly afterwards, with the remaining seven just 40 seconds clear. On the approach to Geraardsbergen for the second time Manuel Quinziato (BMC Racing) attacked, which caused a number of counter moves, but the peloton was all together again as it hit the base of the Muur. Most of the leaders were caught as they crossed the finish line with 28.5km to go, but Burghardt refused to give up. The German rider was pursued by Gerdemann, with Oss and his BMC Racing teammate Greg Van Avermaet, with Saxo Bank-Tinkoff Bank duo Nick Nuyens and Alberto Contador just behind. Van Avermaet and Contador bridged to Burghardt, along with a number of others, including Dutch champion Niki Terpstra (Omega Pharma-Quick Step), Oss, Gerdemann and Heinrich Haussler (Garmin-Sharp), but there was little real organisation and the group couldn’t get more than a few seconds clear of a large chasing group. As the race came together again, with 22km to go, Jan Bakelandts (RadioShack-Nissan) and managed to get ten seconds clear. Jürgen Roelandts (Lotto-Belisol) tried to bridge to his former teammate. Rabobank was leading what was left of the peloton - which numbered less than 30 - behind the two riders; Roelandts was unable to close the gap to Bakelandts however and, with 14km to go, he was picked up by the bunch. Bakelandts was 25 seconds clear by now though, and still going strong. With 12km to go the lone Belgian rider was 40 seconds clear, as the peloton was reforming behind him. The bunch was now more like 60 riders, as Omega Pharma-Quick Step, Liquigas-Cannondale, Saxo Bank-Tinkoff Bank and Vacansoleil-DCM came forward to try to close the gap and, with so much firepower behind him, Bakelandts’ lead was just 15 seconds with 7km to go. As the race hit the Muur for the second time with just over five kilometres to go, climbing the back roads of Gerardsbergen rather than the usual cobbled route, Bakelandts’ adventure was over. Alessandro Ballan (BMC Racing) accelerated over the cobbled top, with teammate Van Avermaet blocking the chase behind him. Boom managed to fight his way around however, and chased down the Italian on the descent. With four kilometres to go, the two riders were together, with a group of ten a few seconds behind them. Boonen, Terpstra and Sylvain were there for Omega Pharma-Quick Step, but BMC Racing duo Van Avermaet and Taylor Phinney was also there, and the two riders were confounding the Belgian team’s chase. With one kilometre to go the duo was still clear, as the race re-entered Geraardsbergen; Boonen was still leading the chase, on behalf of Chavanel’s overall ambitions, but the Belgian champion couldn’t close the gap. A crash in the market square, involving a number of riders - including Haussler - slowed the chase further, but the two riders were approaching the line. Ballan attacked around the final bend with 200 metres to go, and Boom put up very little resistance as he looked over his shoulder to check on the whereabouts of the chase. The Italian took the line alone, but the Dutchman was overjoyed with his overall victory. Ventoso took the sprint for third, ahead of Nuyens, as the chasing group trailed over the line behind them. 7. Svein Tuft (Can) Orica-GreenEdge @ 1'00"
8. Michal Kwiatkowski (Pol) Omega Pharma-Quick Step @ 1'05"
9. Sebastian Langeveld (Ned) Orica-GreenEdge @ 1'07"
10. Jan Bakelandts (Bel) RadioShack-Nissan @ 1'13"